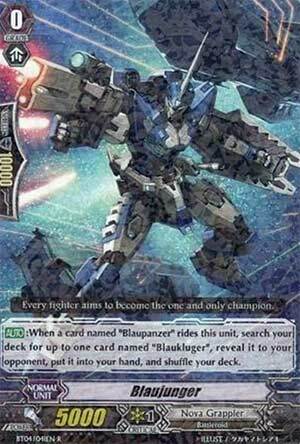 [AUTO]:When a card named "Blaupanzer" rides this unit, search your deck for up to one card named "Blaukluger", reveal it to your opponent, put it into your hand, and shuffle your deck. ...so now were looking at a second generation Ride Chain...which is essentially a Ride Chain from Set 4; the second set to have a Ride Chain. If there is a faltering weakness in the Gen 2 Ride Chains, it's that the deck will either prosper or falter on the first ride of the game. In this case, if you have Blaupanzer, then you're golden for a few turns. However, if you don't, then you basically have to rely on a backup strategy for the rest of the game, and that can be costly in the long run. Minus out the Forerunner effect if it misses (like anything from the Gen 3 or 4 Ride Chain starters), and you have one of the riskiest Gen Chains in the game, and unfortunately, the final form, Stern Blaukleuger, isn't as formidable as it once was when it first came out.